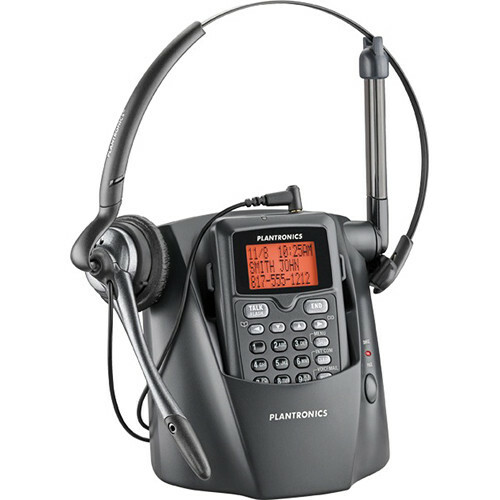 The CT14 DECT 6.0 Cordless Headset Phone from Plantronics features DECT 6.0 (1.9 GHz) wireless technology for better reception at greater distances. With this Plantronics Cordless Headset Phone you can take your call with you up to 300 feet away from the charging base and talk for up to 10 hours at a time. You also benefit from noise-canceling technology to help filter out background noise allowing you to talk in noisy environments. Simply clip the dial pad onto your clothing with the integrated clip and then position the headset over your head or on your ear for improved comfort for those longer phone calls. Voice-dedicated DECT 6.0 wireless technology provides enhanced sound and limits interference from wireless networks and home appliances. Single-line analog phone has up to 10 hours of talk time and includes features like Caller ID, one-touch voice mail access, mute and volume control. Ultra-compact "take with you" dial pad features an integrated belt/clothing clip. With a range of up to 300 feet, your activities won't interfere with important calls. Position the flexible mouthpiece where you want it and reduce unwanted background noise with the noise-canceling microphone. This headset can be worn over-the-ear or over-the-head. CT14 DECT 6.0 Cordless Headset Phone is rated 4.2 out of 5 by 96. Rated 4 out of 5 by Julie25 from Phone/Headset Connection Point I bought the CT14 a few years ago. In the last 6-8 months, had problems with the connection between the headset and phone. I saw several complaints on the forum with the same problem. I am purchasing a a replacement today. But, I spoke with tech support to ask if Plantronics had remedied the problem with the phone and he said there were no reports of this problem on the forum. I just reviewed the forum again today and saw 3 reviews with this issue. Please Plantronics, fix this problem. I don't want to have to continually replace this phone due this issue. Thank you. Rated 3 out of 5 by Mike from Almost Great. Love almost everything about this phone. Comfortable, good sound quality and insane battery life. But, get this. You can't use the phone to set up a 3 way call. On the cheapest of phones, you can call one person, "flash" the call, then call another person, "flash" the call again and be set up for 3 way calling. It's almost impossible to believe that this phone, from one of the most successful and experienced phone companies in the world, can't do this simple function. Oh well, time to look for alternatives. Rated 4 out of 5 by Kevin from Very Good Value My 3rd unit. They are the best for reception, clarity and comfort. Very comfortable. However, the connection where the headset meets/plugs into the phone is weak in design. I am replacing this unit for the 3rd time in 10 years. This connection degrades because of tension caused by mishaps. Like the unit though. Need to fix this weak area. Rated 4 out of 5 by Brad_H from Solid Performer Both my spouse and I work from home extensively. I gave up on speaker phone usage for many reasons (annoying to others and confidentiality) as well as the traditional oversized wireless handsets. I wanted a solution that was small and a solid performer. I live on this phone unit! I have my phonebook entries for routinely called numbers and the battery time is impressive. I did replace the headset for one that is a "behind the neck" style. There are some advance features which could be added but for the money this is a solid performer. Rated 5 out of 5 by Richard from Plantronics Multi-task Around 1990 there were several wireless head-sets at home and office. Plantronics was and still is far superior. The sound quality is better and more intimate and clearer than a hard-wired or cell phone. The original CT-12's are still usable but the CT-14 are better. There are two here and one at Nancy's for evening chats by candlelight. I was weeding the garden, on hold for an NPR national program, when my reverie was broken with, Richard You're on the air. It was a hot moment in the broccoli patch. You can also type, check email and Google seamlessly. I needed a new phone because the phone, sans head-set dropped into the laundry basket! It didn't need drying. Rated 4 out of 5 by Carl_D from Phonebook Fail! The CT-14 is fine for me, except the phonebook only allows numbers up to 20 digits. This is a huge product management failure. How can a phone company not understand that with conference dial codes these days, 20 digits is not nearly enough? Now I have to enter my own and my colleagues conf codes manually when I can automate this even on my cell phone. This is a bizarre shortcoming on an otherwise good phone. Rated 4 out of 5 by CherawGirl from Does exactly what I needed it for. I work from home and am on conference calls most days. My cordless handset with headset would die after 2 hrs. This little phone goes all day. The headset comfort I'd give 4 stars, I haven't used the ear only headset as I prefer the over the head one. There is a very small amount of static on the line, but that may be due to interference in my home/office. Overall, I am very please with this product and it came at a reasonable price. I could not find anything to compare with it when I was shopping for this kind of phone. Rated 1 out of 5 by Jamie T from Not a good experience I have had this phone less than 1 year and in addition to connection drops where the display shuts off and then restarts while you are on a call, puts the call on hold and then finally allows you to unhold and try to salvage your phone call, it has altogether died as of today. I had the connection drop and restart happen on several very important phone calls and it was quite embarrassing as it happened 2 or 3 times in sequence. The concept & design is good but the product itself is seems cheaply engineered. The headset unplugs very easily from it's base which happens while you are on calls and is very annoying. The clip is not good and keeps the phone snug only if you are wearing jeans...otherwise it comes undone or falls too easy. It was overall a hassle to use if you are on the phone often and get up to move around frequently. In a manner of speaking, yes it is. What I mean is the headset is wired, (plugged into), the handset, and the handset is wireless to the base. You basically walk around with the handset clipped to you while wearing the headset. No. The headphone is corded. does the mute button also display status on the screen? Does it work well with a Comcast phone line? I would like to buy my quadripalegic friend a phone equipped with a headset. What I envision is a regular phone which rings in. A caregiver answers the phone and the caller asks for my friend. The caregiver straps on the headpones enabling my friend to talk hands-free through the headphones mic?